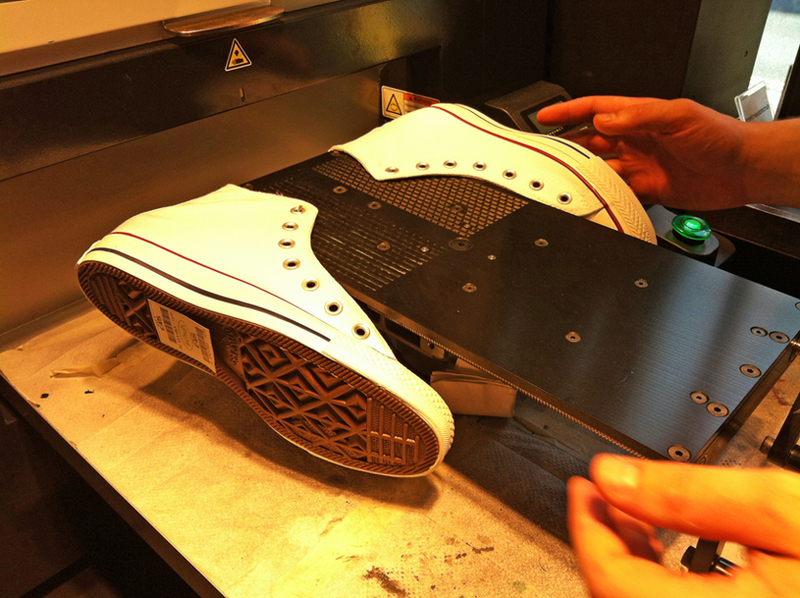 Customise your Converse exclusively at Schuh's London flagship store until 15th August. To celebrate this year's Represent, Converse's series of free gigs at the capital's 100 Club, a customisation service has taken over the windows of Schuh's Oxford Street store, offering you the chance to pimp up your sneakers. 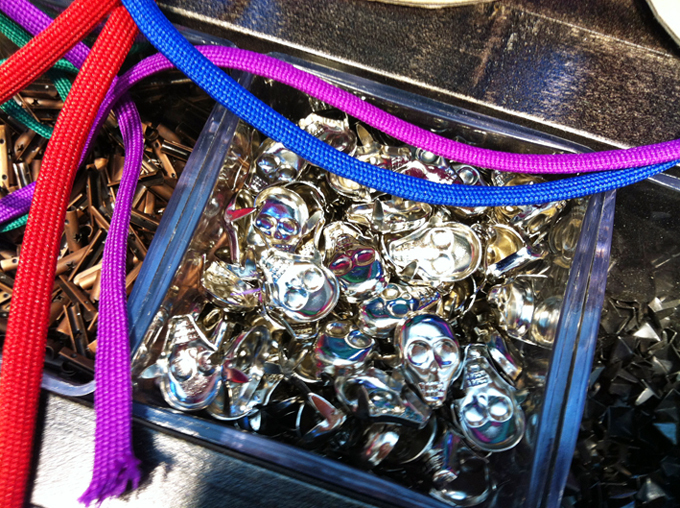 At the studs and laces bar (below) you can choose hardware in the shape of spikes, stars and skulls, as well as laces in every colour of the rainbow. You can also get your Converse inked. 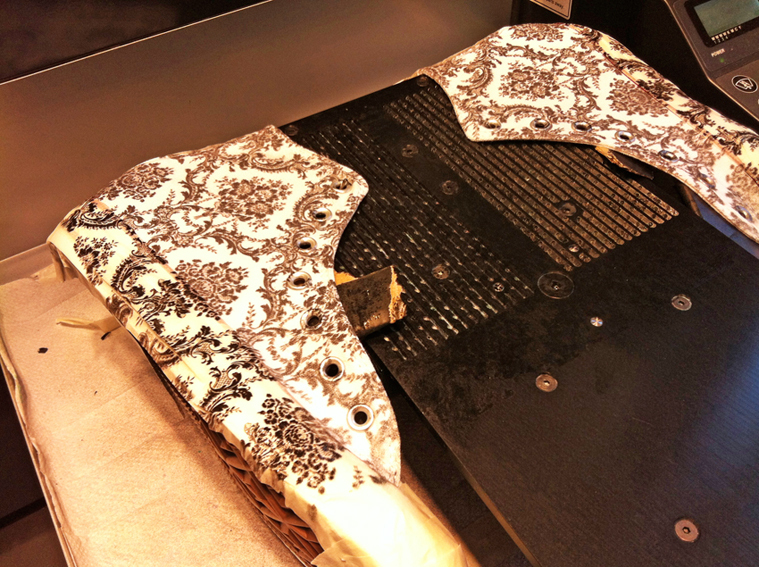 Simply choose a design from the two iPad stations and your shoes are printed in-situ. Graphics range from London imagery (think bowler hats, red telephone boxes and Big Ben) to sport-inspired pictures to tattoo designs, patterns and much, much more – including typefaces so you can print anything from your name to a slogan. Here's how it works. First pick your Converse. 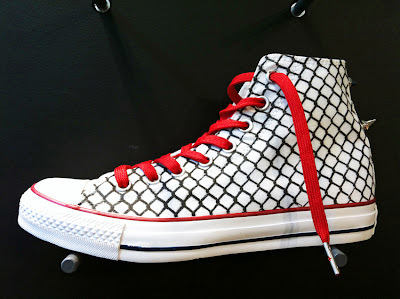 Next choose your artwork, hardware and laces. 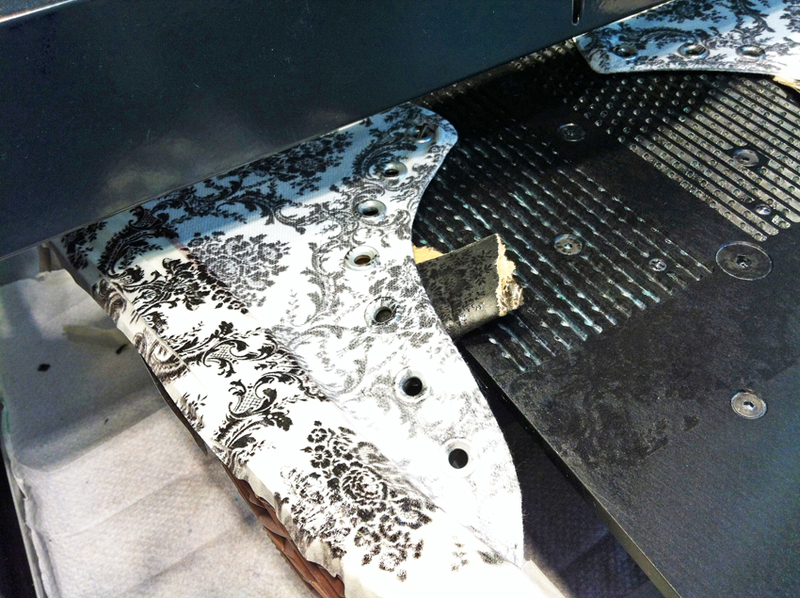 Then work with one of Schuh's 'maestros' to create an original, unique design. 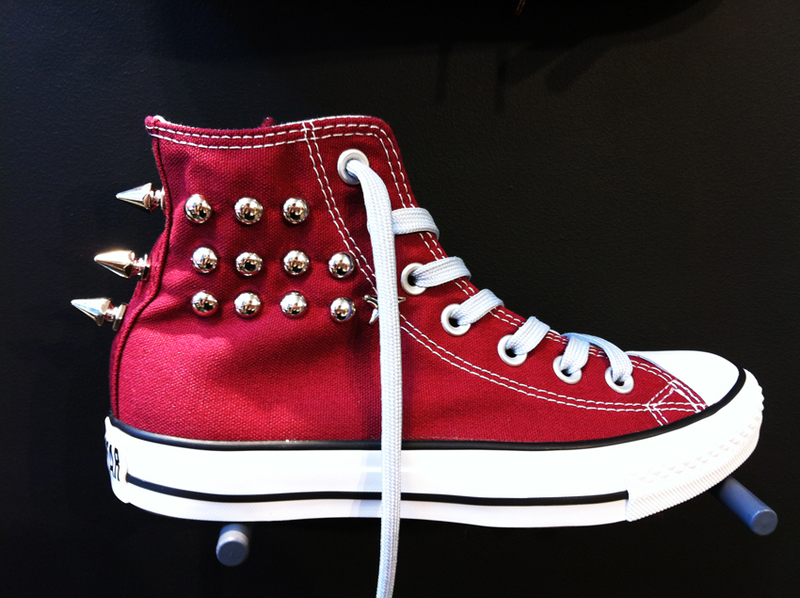 You get a free pair of laces or a bag of studs and grommets with your Converse purchase (which are £43 for lo-tops and £45 for hi-tops). Then additional studs and grommets are 50p per pack of four and laces are £5. 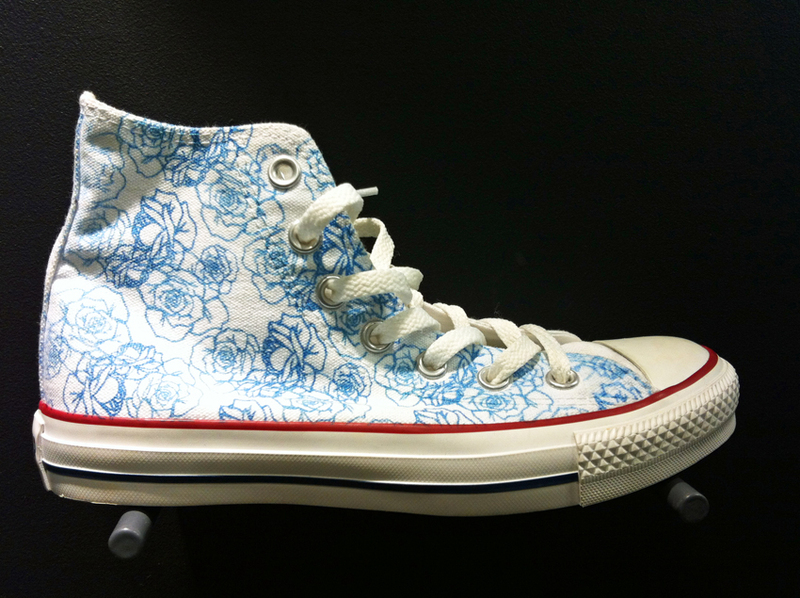 To get your Converse inked, it's £10 for one side, £15 for two sides and £25 for an all-over design. Your customised Converse are finished within hours, but due to the popularity of the service during its first week, it may take a little longer. 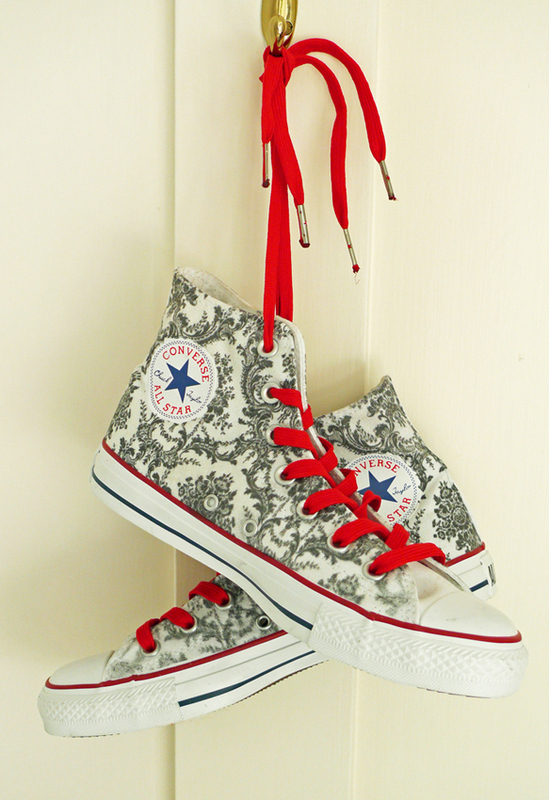 For my customised Converse, I opted for a pair of white hi-tops and chose an all-over wallpaper print and red laces. The baroque pattern is very next season, don't you think? I was lucky to see them being inked, too (below). The soles are covered in masking tape so that the racing stripe remains untouched. Finished shoes are put on display until customers pick them up, which makes for an ever-changing wall of inspiration. Below are some of the designs other customers have created, from an all-over zebra print to a personalised typeface (the other shoe should have read 'Bargainista'!) to punky studs. 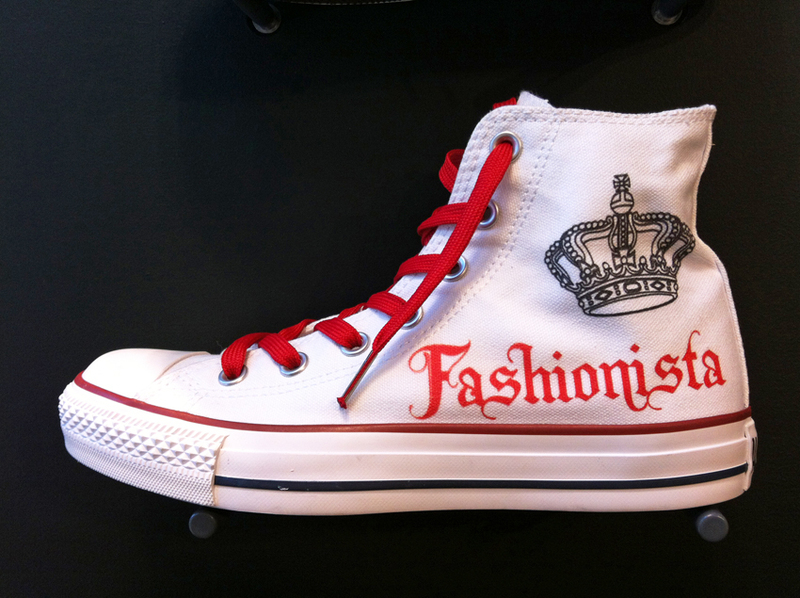 How would you customise your Converse? Let me know and share your design on Twitter with the hashtag #getinkedatschuh. 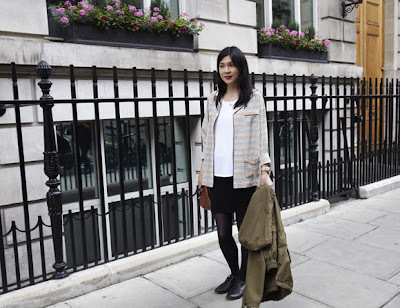 I couldn't resist the Maison Scotch quilted jacket from ASOS that I recommended last week. I think maybe you couldn't either as it's sold out now. Reduced from £200 to £80, it's an affordable price for a lookalike Isabel Marant quilted jacket. 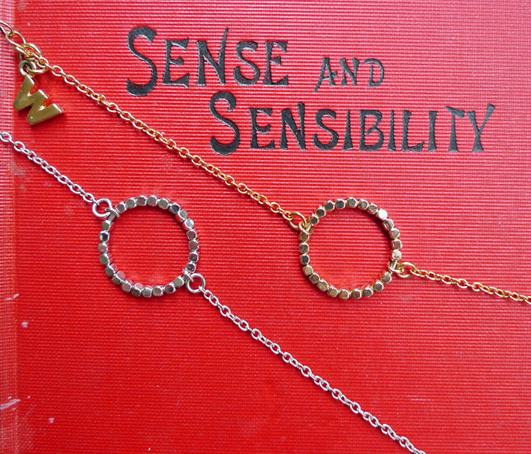 And see how beautifully packaged it was when it arrived – it looked almost too good to untie! But with a label reading 'To Be Worn With Love', I couldn't wait to try it on. 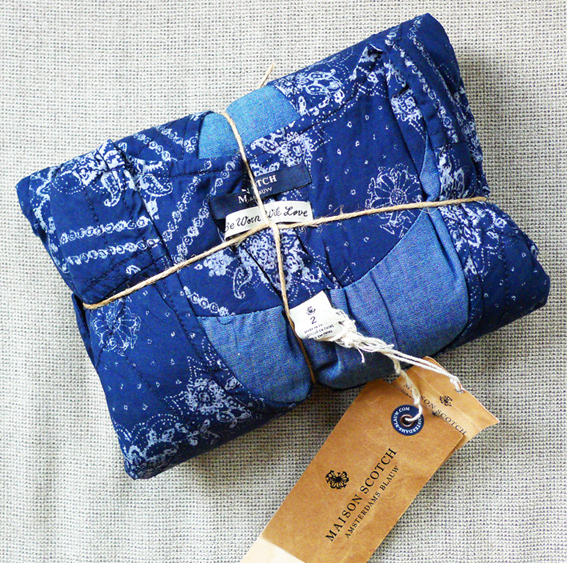 It's a very lightly quilted cotton jacket, with an all-over lace pattern that looks like is been batiked on and then dyed a rich indigo blue. Blue cotton chambray provides a contrasting lining. Luckily for my bank balance, size 2 was too big. So if you're a UK 10 and fancy an Isabel Marant-style jacket, keep a look out on ASOS as it's winging its way back. I hope someone else will wear it with love. 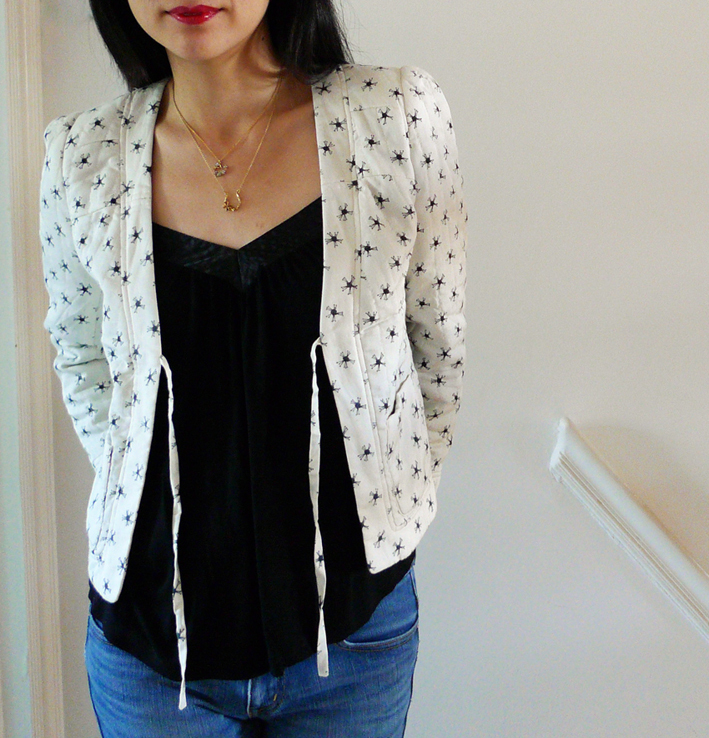 This Mapperton jacket by Aubin & Wills is one of my most recent and favourite sale purchases. It's reduced from £125 to £65. 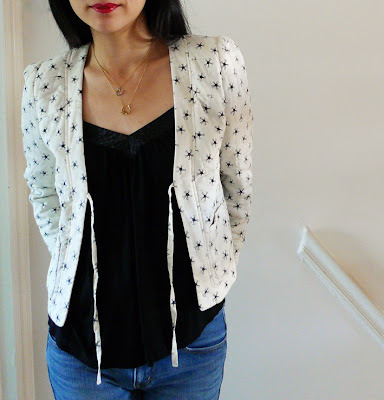 A quilted silk and cotton jacket, I love its bohemian style with a star print on the outside and a black daisy-print lining (making it almost reversible!). Sales assistant Harley at the Southwold branch of Aubin & Wills (I was shopping at this seaside town after last weekend's Latitude festival) described the pattern as balls of wool and knitting needles, which made me love it even more! Like the print, too? It also comes in a camisole top, blouse, dress, bag and laptop case; the latter is just £15 in the sale, reduced from £40. I've been looking for a quilted jacket – in the style of Isabel Marant rather than Barbour – for some time now so I'm very pleased I've found this one. It's lightweight enough for summer (and not bulky at all) while keeping you warm during cooler days and nights. Plus, come autumn/winter I'll be layering mine for extra insulation! I also like this Maison Scotch quilted jacket (below). It's reduced from £200 to £80 in the ASOS sale. Plus, if you shop before 9am tomorrow (Monday 23rd July) you can get an extra 10% off sale prices with the promo code 10SALE, taking it down to £72. Which jacket do you like best? Origami is on my list of things to learn. The magic of creating something 3D from a few folds of paper makes me wish it was a talent I possessed. It's a beautiful, delicate art form. Now imagine that skill transferred from paper to sheets of precious metal. That's what Parisian designers Claire Naa and Arnaud Soulignac of Origami Jewellery do. 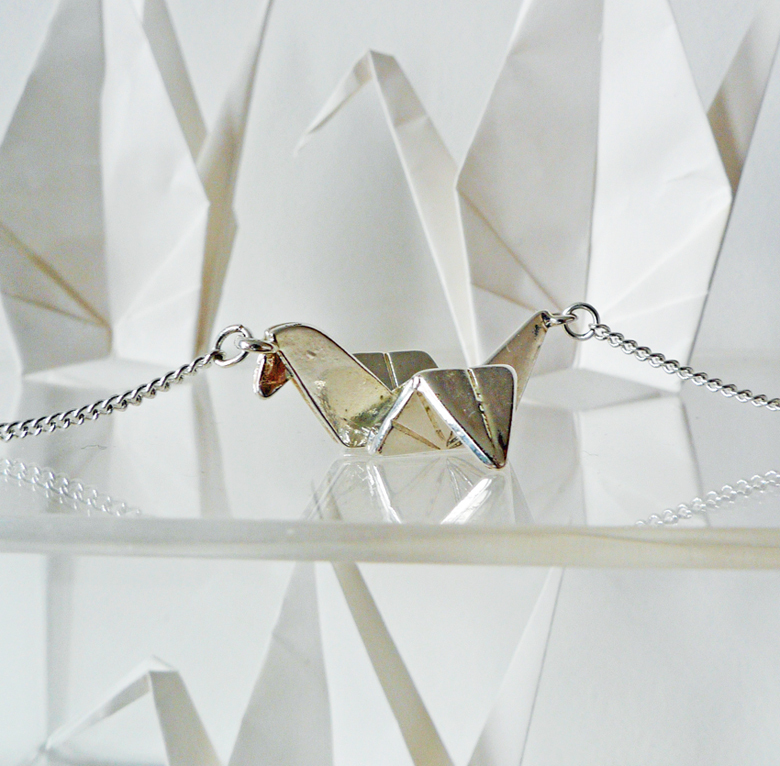 Their origami animals (think swans, rabbits, elephants, lions and more) in silver, gunmetal and gold-plate are what I'm saving up for next. Check them out at online jewellery and accessories boutique Boticca and let me know what you think. In the meantime, I'm making do with this cast-metal version from Monki. 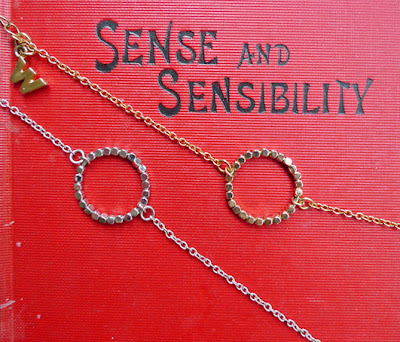 An elegant crane necklace, it's the next best thing. And it's only a fiver, too. The paper origami cranes are mementos from my friends Nicky and Phil's wedding. They were the most exquisite table and hanging room decorations. So pretty! Let me introduce you to Charlotte Taylor. I've only discovered her myself (thanks to the lovely Jutta at Alex Monroe), but I'm so glad I have. She worked with Luella after graduating from Central Saint Martins, setting up her own label in 2009. You might have seen her designs on Emeli Sandé (she's got the a/w 2011 robot shirt) or at Anthropologie, one of her many UK and US stockists. Not shy with her use of colour, her prints in particular are bold and bright – perfect for working this season's head-to-toe pattern clash. Like what you see? Well, here's a date for your diaries. Charlotte Taylor is having a sample sale at her London studio next week from Monday 16th to Wednesday 18th July, from 5pm to 8pm daily. 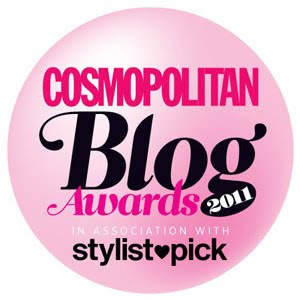 Designs from her a/w 2010, s/s 2011 and a/w 2011 will be on sale, with up to 80% off. And prices start at just £10 for accessories such as headscarves and belts (cash and credit cards accepted). 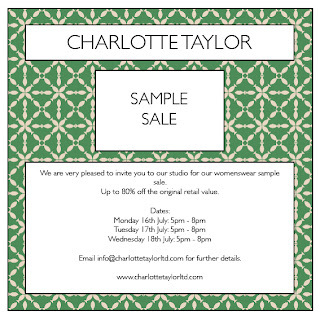 Email info@charlottetaylorltd.com for further details. And let me know what you get. I'm so gutted I won't be able to make it. 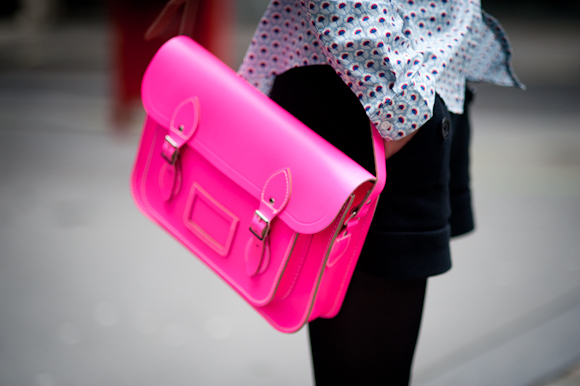 The Cambridge Satchel Company's fluoro bags have been insanely popular this season. At work, I've counted five alone: two pink, one yellow, one orange, one green. For me, my fluoro satchel is the Day-Glo equivalent of happiness, so what better way to work this season's neon trend? I've been contemplating getting my Cambridge satchel embossed. I like the idea of personalising it with my initials and The Cambridge Satchel Company offers four styles of lettering: black, gold, silver and blind (ie no colour fill). I think the latter would look good on my fluoro bag. 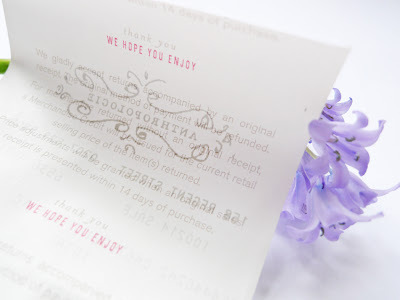 Embossing isn't too expensive, either – £5 per letter with a cap at £20 for four or more. Ha, for £20 I could have Bargainista Fashionista emblazoned across my satchel. Would it fit I wonder? Mine's the 13-inch satchel if you're weighting up what size to get. It's spacious enough for all my daily essentials, plus an iPad fits in easily. However, I do hanker after a personalised Cambridge satchel in classic red after spotting actress Zooey Deschanel carrying one. It looked the cutest. Hmm, maybe I need to get another satchel. But, oh, what colour embossing to go with red? Suggestions please! I was just flicking through my photographs when I came across this one. It's the receipt for my Anthropologie cup. The message on the back of the receipt – 'Thank you. We hope you enjoy' – is a nice touch. It's so very polite and courteous, which is often overlooked on the high street don't you think? And yes, Anthropologie, I am enjoying very much. I loved my little cup so much I went back and got the matching bowl – it's now my weekend breakfast set. Right now, the Anthropologie sale is in full swing. For any domestic goddesses out there, look out for Anthropologie's aprons which are designed like retro dresses. Simply pick your 'vintage number' and you'll look super-stylish in the kitchen! There's more styles in store than online and they're reduced from £32 to £19.95. Let me know your Anthropologie recommendations. 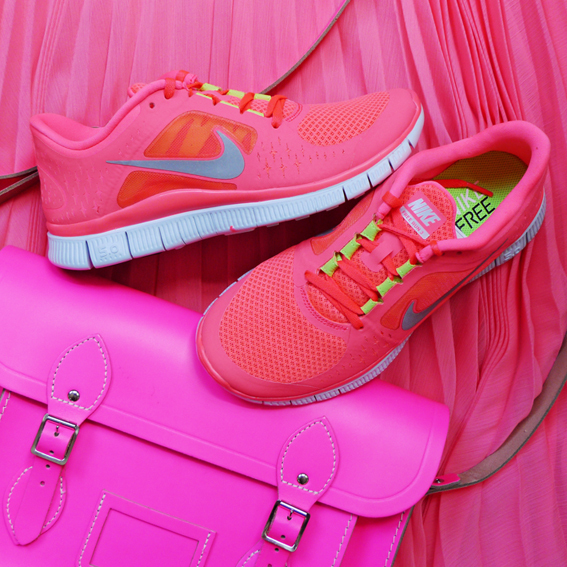 While I love The Cambridge Satchel Company's Tangerine Tango bag, pink is my first choice of colour, from my own fluoro-pink satchel to my pink Whistles Carrie skirt to my new pink Nike Free Run+ 3 running shoes. First, let's get this straight – I'm not a head-to-toe princess-y pink kind of girl. Nor, contrary to this picture, is my wardrobe overflowing with items in pink. But I am partial to the colour, especially as an accent or as a bold, bright pop. What about you? 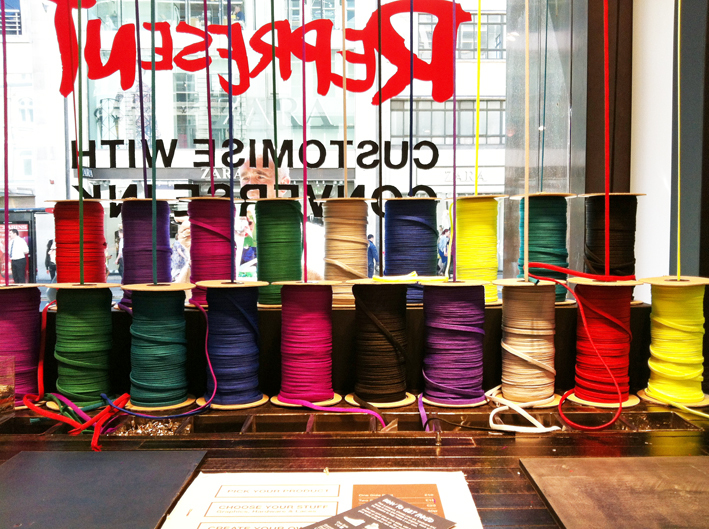 What colour defines your style? Pink and grey is one of my favourite colour combos, so I'll be wearing a grey marl sweat top from Whistles (£50) with my Carrie skirt; Gap's grey jersey T-shirt maxi dress (£29.95) with my Cambridge satchel (I've got the electric-blue version and it's so comfy), and a grey tee and shorts with my Nike running shoes (I've started running again in an attempt to get bikini-ready!). Obviously, the shoes and satchel are available now if you want your own pop of pink, while Topshop does a very similar pleat skirt. It's £25 in the sale, reduced from £48, and has side splits, front and back. You can get the Nike Free Run+ 3 running shoes (£80) in a choice of eight colours, or you can design your own colour scheme using the NikeiD customisation tool. 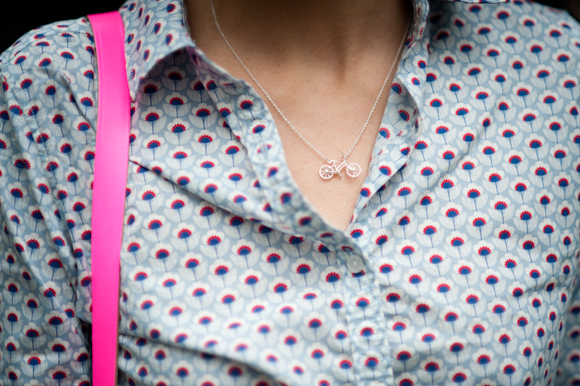 And the satchel comes in myriad colours from £74, with four fluoro choices from £105. Meanwhile, spring/summer 2012's reincarnation of the Carrie skirt at Whistles is called Lottie. She comes in a pale blue and is reduced in the sale from £110 to £65. Lastly, for Cambridge Satchel fans, check out its clearance page. Seconds, with varying degrees of flaws, are offered at reduced prices, from £50. Let me know if you find anything.